Among cult-movie enthusiasts and Hong Kong action connoisseurs—one and the same, really—director John Woo inspired a reverence in the late ’80s and early ’90s rivaled only by Chow Yun-Fat, the tremendously cool leading man Woo molded into an icon. Back when I was part of a programming group for the Tate Theater, a repertory house on the University Of Georgia campus, we booked Woo’s The Killer entirely on faith, and the trailer alone drew oohs and aahs from the audience—which later filled the 500-seat theater to capacity during its two-day run. In films like The Killer, A Better Tomorrow, Bullet In The Head, and Hard Boiled, Woo succeeded in isolating sequences like the big shootout that ends Sam Peckinpah’s The Wild Bunch and protracting them into a slo-mo ballet of blood squibs, pyrotechnics, and scattering birds. As we’ve entered a digital age where anything is possible—with the immaculate favored over the visceral in action fare—Woo’s choreographed battles are a prevailing influence, a standard of anti-realist perfection. But when Woo left Hong Kong for Hollywood to make 1993’s Hard Target, the Woo mystique evaporated. At the time, the push-pull between Woo’s signature style and the conventions of American movies—specifically, the conventions of movies starring Jean-Claude Van Damme, who was coming off low-rent hits with Kickboxer and Lionheart—seemed to defeat the director. Conventional wisdom held that Woo had fatally compromised himself by accommodating Van Damme’s style of dumb violence, to say nothing of his greasy mullet or a wondrously Cajun Wilford Brimley. It was a story nearly as old as movies themselves: Visionary foreign director comes to America, gets chewed up by the system, never reaches his former stature again. And while that’s generally true of Woo, his American work is consistently undervalued. Twenty years later, Hard Target has more in common with his Hong Kong films than anything else he’s made in Hollywood. It’s a sturdy bridge between two markedly different filmmaking cultures. As the fine Korean genre stylist Kim Jee-Woon (I Saw The Devil) learned recently with the Arnold Schwarzenegger vehicle The Last Stand, however, working with a major action star puts the game on his turf. Critics could draw clean lines between Woo’s Hong Kong films and those of vaunted auteurs like Peckinpah and Jean-Pierre Melville, Le Samouraï especially. 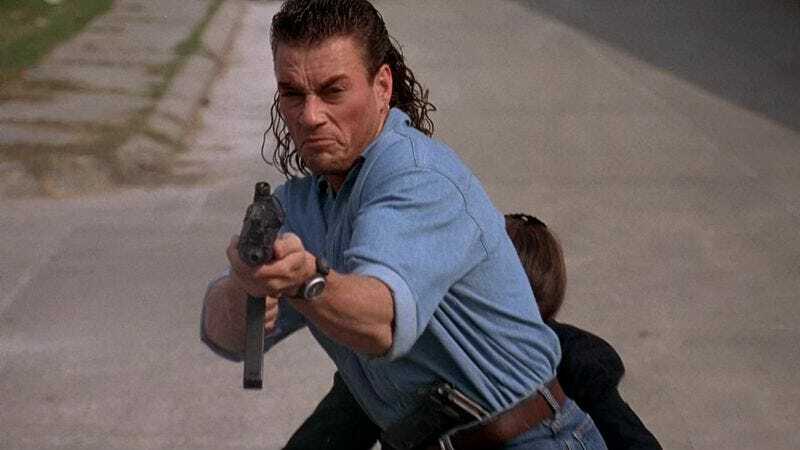 But Hard Target, a vulgar twist on “The Most Dangerous Game,” is full of the perfunctory elements that stock other Van Damme films, like a foxy love interest, lead-booted henchmen, and line-readings a half-stop above phonetic. (Van Damme promoted/sullied the reputation of another Hong Kong legend a few years later with Tsui Hark, who did the one-two of Knock Off and the previous New Cult Canon entry Double Team.) With Hard Target, Woo didn’t necessarily make a great John Woo movie—no one, myself included, puts it on a level with his best Hong Kong work—but he made a transcendent Jean-Claude Van Damme movie, one that exploits its star’s physical gifts while demonstrating his genius for action choreography. Getting there takes some doing, however. Hard Target’s highlights are largely backloaded, relegated to the swamp-country mêlée that eats up the final third. The action beats hit with metronomic regularity, but there’s a lot of heavy lifting to get all the wooden pieces in play. Giving his Belgian accent a Cajun flavor (in theory, anyway; in practice, he’s as stilted as usual), Van Dame stars as Chance Boudreaux—so named, he says, “Because my mother took a chance.” A merchant marine who works odd shifts on the docks of New Orleans, Chance proves his mettle when he rescues damsel-in-distress Natasha (a very poor Yancy Butler) from a gang of ruffians. New to the city, Natasha pays Chance to help her look for her father, a homeless veteran she hasn’t seen in years. When her father turns up dead, the two seek justice from the men responsible: an underground ring, led by glowering villains Lance Henriksen and Arnold Vosloo, that gives cash to the poor and forgotten to act as targets for rich guys looking to hunt human prey. How’s that for social metaphor? “It’s like a drug, isn’t it? To bring a man down?” asks Henriksen of another satisfied client, and into the illicit world of man-hunting-man we go, for at least the fourth time on film, on top of the many more times on radio and television. Woo’s engagement in the “Most Dangerous Game” premise—much less the politics of rich hunting poor—extends only so far as it can feed the atmosphere and dynamic motion that defines his aesthetic. Hard Target views New Orleans through the lens of an enthusiastic tourist, eager to take in the sights: horse-drawn carriages, the French Quarter, the weeping willows in the Bayou swamp. There’s even a shot of Van Damme slurping through a bowl of gumbo and a climax set in a warehouse filled with deconstructed Mardi Gras floats. It couldn’t be any more New Orleans if Henriksen were dabbing beignet sugar from the corners of his mouth. During his time as a Hollywood director, Woo was never the sort to rescue bad material, so much as he animated it to the best of his ability. The only time the script and performances matched the operatic grandeur of his filmmaking was Face/Off; the rest of his English-language work consists of isolated moments of greatness in films that aren’t always worthy of them. Hard Target signaled this decline—and fans responded accordingly at the time—but now that the dust has settled, it remains the fullest American expression of what he does best. It’s also an example of how even the most generic genre elements—the warmed-over “Most Dangerous Game” premise, the cardboard villains and damsel-in-distress—are a means to a end, the narrative forces that push our hero into the shoot-’em-up sequences that really matter. And that’s where Hard Target delivers, big time.